You are purchasing a Lake Erie Fearfest ticket good for 5 Haunted Houses and the Haunted Trail including the New Haunted House Dead in the Water valued at $22.00 for only $11.00 each. Looking for the best haunted house in Ohio? 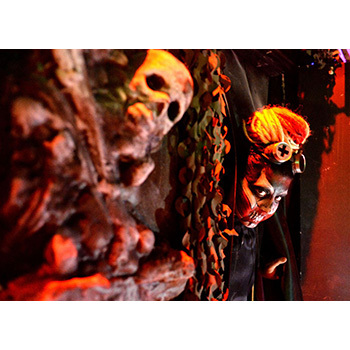 Lake EERIE Fear Fest at Ghostly Manor Thrill Center is the one haunted house in Ohio you don't want to miss this Halloween! With six attractions in one, Lake EERIE Fearfest the #1 Haunted House in Ohio, Forbes Magazine lists us in its Top 10 Haunted Attractions in the country, and The Scare Factor rated us #3 Must See Haunts in 2016! Located in Sandusky, Ohio, we are just minutes from Cedar Point's Halloweekends, Kalahari's Waterpark, and the Great Wolf Lodge Hotel. Need a place to stay nearby to make it a weekend? Stay nearby at the Econo Lodge Inn & Suites in Sandusky, Ohio. We look forward to seeing you this Halloween! MUST have ticket in hand to be valid - online purchase is not valid. Hard tickets will be mailed to you with purchase.